I was looking at the Pacific, at the waves, at the cloud formation in the sky and reflecting on the beauty and the violence of it all. Suddenly, it even occurred to me that someone else, standing right here, a hundred years ago, might have had the same thoughts looking at the same panoramic view. And I liked that. I like to see us linked beyond time and place. Yes, it is the same link but then my mind - and my imagination - struggle more to grasp this. But faith in God helps me understand and internalize better the extremely big - and the extremely small - as Pascal said. Faith and reason bring the whole puzzle together. Faith in the God of history, the Father of the Word Incarnate, brings true coherence and wholeness. Thank God for the Judeo-Christian tradition and for its understanding of time! Thank God for the Incarnation, thank God for Jesus Christ who came for all of us, for the whole world! It seems that, for some, the love of science and reason is sometimes understood only as an "either…or" approach: either you believe in science or you believe in God. This is one of the most truncating and degrading view of all. Because both science and religion need to interact with each other. As JPII said "Each can draw the other into a wider world, a world in which both can flourish." The temptation of reducing things and concepts, of putting them in little boxes, each with their own little label, is a very popular temptation. Watching the waves of the Pacific help me see the big picture. It helps me embrace a more creative approach. 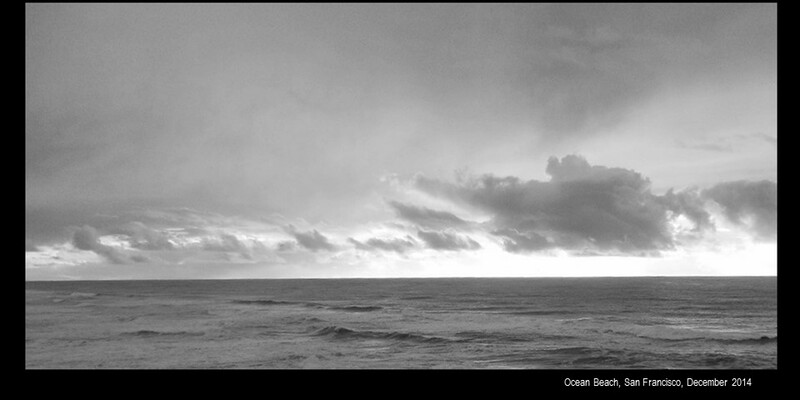 It helps me see that studying the ocean is as valuable as writing poetry about it. We are truly meant for more, for bigger things, for reaching out to increase beauty and love, truth and justice in the world. And then the beauty of this ocean and this sky tonight resonate so well in my heart that I wish I were a musician so I could share it better. But I'm not, I can only take photos and write a few comments. But I am sure that our mind and soul can store everything in more ways than one, so the energy I feel right now gives me courage and will help me spread love and peace in this beautiful season of Christmas 2014. Or so I hope. The truth is, I'm pretty weak on my own and will resort to self-centered and lazy thoughts any day. This is why I need the grace of God. And the blessing of living next to the ocean. being able to share my time between Northern California and the French Alps. Enough for tonight, I'm getting cold, I'm going home.